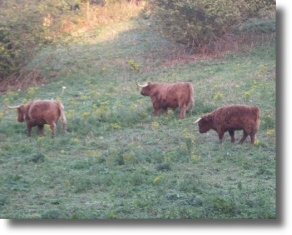 Highland cattle are the ideal choice for conservation grazing. They are hardy grazers - they will eat a wide range of vegetation unpalatable to most cattle -, live out in all seasons and weathers, and have a long breeding life. Furthermore, they are relatively light in weight and therefore reduce poaching of the ground. Highlanders are an essential tool for Wight Conservation. Initially, a few were purchased to "scrub bash" on Mottistone Down, helping the machinery to clear the remnants of the destroyed forestry and the secondary growth resulting from the great October 1987 storm. With their long powerful horns, they fearlessly bash and clear their way through the thickest of scrub and undergrowth, eating much as they go. They trample down bracken and brambles. Where they clear, grass naturally regenerates. In spring they eat the succulent shoots of weeds we would otherwise have to control. 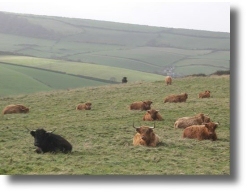 The Mottistone Highland Cattle are now a well known and welcome feature on much of the Island’s landscape. In summer they can be seen on Mottistone Down, or perhaps from the bridle path at Rowborough Bottom, clearing and controlling the fresh vegetation. The restored chalk grassland you will see is much due to their clearance and grazing. 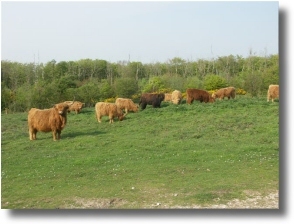 Except for a small group of mature cattle which stay at Rowborough to continue attacking the scrub, the remainder is removed to Wroxall for their winter grazing. From mid September nearly all the cattle are moved to the Downs at Wroxall where they graze back the summer’s growth. 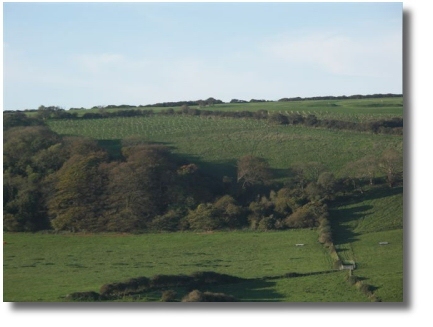 They can be seen from the public rights of way on St Martin’s Down and Wroxall Down West. After the hills have been grazed down to the desired length, usually by early February, the cattle are then moved to the lower pastures, allowing the spring and summer flora to develop and flourish. Wroxall is now important for its cowslips, orchids and other valuable flowering species. In late winter, as the grass loses its goodness, natural grazing is supplemented by hard nuts and hay made on the estate, avoiding any "alien" seed imports. Unless very sick, the cattle are never under cover. Although we have not applied for organic status, our policy is to follow as many organic principles as possible. The cow’s annual cycle begins when the calves are born between the 1st February and 30th April. On the 1st May the bulls are put in with the cows and heifers and then removed by the 1st August. Pregnancy lasts 9 months. Calves are identity-tagged within 24 hours, and before 6 months the young males are castrated and de-horned. De-horning makes them much easier to manage during subsequent handling and transporting. By 9 months all the calves are weaned. The steers remain in the Wroxall lowland fields until they are sold or sent to a "finisher" who specialises in Highland meat. In the spring, the young heifers are sent to graze either at Mottistone Down or Idlecombe, returning again to Wroxall in the autumn. The heifers with good conformation are retained as breeding stock, whilst the others are sold or kept until slaughter. Heifers are introduced to a stock bull when three years’ old and should breed annually thereafter up until about 18 years old. Barren cows are selected as "nannies" to the young heifers at Mottistone and Idlecombe. Wight Conservation breeds selectively, choosing heifers of good pedigree, size, and conformation for beef production, with correct heads and horns. Because of the scale of public access on the estate and the ease of handling, temperament is another important feature. Our aim is to build up the largest and best quality fold in the South of England. 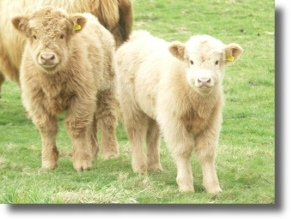 Our three stock bulls were purchased from Scotland because we want to retain the breed’s tough hardy characteristics. 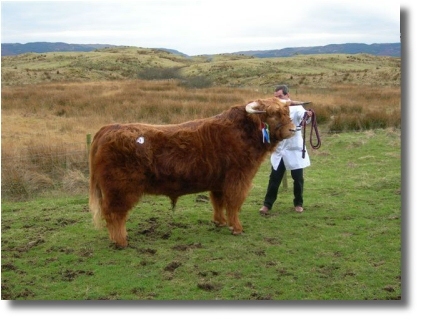 Ruairdh (Rory) of Glengarnoch (a champion bull at the Royal Highland Show in 1999) was purchased at the Oban Sales in spring 2004, Eoin Mhor of Miungairigh in 2006 and Guag 1st of Culfoich in October 2006. Our homebred Iasgair of Mottistone, which served as a bull in 2005, was the top priced bull at Oban in 2006 after winning the overall Bull Championship for us. We regularly visit the Oban Sales to top up our stock by purchasing the best blood lines from the hardier and rough-weather Scottish folds. In February 2003, we purchased the overall Female Champion, the three year old heifer Lucy of Balure who has since bred two calves for us. The first, a bull calf, is very closely connected to this year’s Oban champion Bull. In February 2005, we purchased the Champion Female, Iseabal 9th of Carsaig, and in October 2005 we purchased our third Champion Female, Kerrie 2nd of Earn. Bull calves out of our championship-bred cows will escape castration and be taken from the main fold at weaning. If exceptional, they will be kept by Wight Conservation as stock bulls, but otherwise sold. We are continually seeking to improve the quality of our stock. We have been fortunate that most of our stock comes from very good blood lines. In time we will develop our own. In addition to the original unregistered but good looking cattle purchased by Philip Butchers, our main subsequent purchases have been from the Balure, Brookfield, Kiln, Ellerdine and The Pheasant Folds. In 2003 and 2006 we purchased groups of heifers from the Kindrochiad Fold on Islay; they contain some of the best and oldest strains in the Stud Book and are the hardiest of stock. In 2006, 60 cows and heifers were bulled. Each year we will have on average up to 30 pedigree heifers and cows for sale. 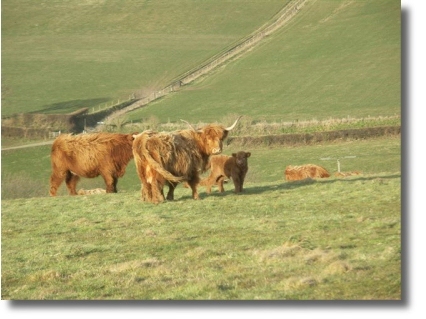 They will be advertised either on Wight Conservation’s or the Highland Cattle Society’s websites. Avoid placing yourself between a cow and her calf. Her instinct is to protect her calf and she could go for you. Do not approach and try and touch a Highlander. It is not used to human handling and could react nervously. Its horns are very big! Keep your dog close to heel if you are on a bridle or footpath. All cattle sometimes run after dogs, and by not using a lead the dog can easily escape and keep the cattle away from you. Should the cattle rush you with your dog on a lead, let go of the lead. Walk around and not through the cattle.